Our older cat, Echo, has developed a bad habit of keeping us awake at night. I originally thought this was because he was hungry. But, when I realized he wasn't eating the food I was giving him, I started to suspect he wanted to play instead. As a result of this, I stopped at the store in search of a toy I could get him (and our other cat, Mouse) to play with. After looking at some other options, I ended up buying this product. 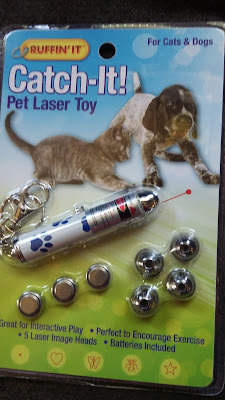 This isn't the first laser toy I've purchased for the cats. We had a similar one that no longer works. Echo would play with that one on occasion but was never really a huge fan of it and, because of that, I did have some doubts about this purchase. But, it was less than $3 so I decided to give it a try anyway. One thing I noticed about this product when I first purchased it was the fact it had a total of 5 interchangeable tips that gave the laser pointer different shapes ranging from a star to a butterfly. At first, I wasn't really sure if the different shapes would really make any difference. But, as it turns out, it was something that made a huge difference. When I first took this laser pointer out of the package and shined it for the cats, it was just the standard red dot. Mouse, as expected, liked this and chased it. However, Echo had almost no interest in it and, since he was the one we primarily purchased this product for, I began to wonder if I wasted my money. Then, just out of curiosity, I changed tips and shined a laser butterfly on the floor. Echo went nuts and started chasing the fake bug throughout the house to the point he was out of breath. I haven't seen him play that hard sine he was a kitten. 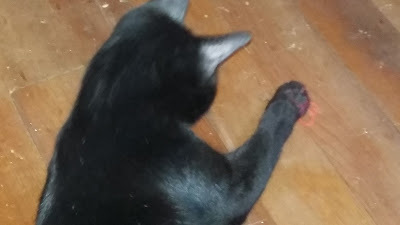 And, when I took the laser pointer away for a bit (I was afraid he would give himself a heart attack), he continued to look for the butterfly and I eventually had to cave in and play with him again. Last night, as always, he was in our room being a pest and, as planned, I got up to play with him. This worked like a charm. He chased the laser butterfly for about 5 minutes then let me go back to bed and didn't bother us the rest of the night. Even after losing the 5 minutes, it was the best night's sleep I've had in months. As a result, if you have active cats (or dogs) in your house, this is a toy I would definitely recommend. It was affordable and has already given my cats hours of enjoyment.